I haven't even mentioned one of the film's greatest strengths, its villain. Michael Keaton plays Adrian Toomes, better known to comic book fans as The Vulture. Toomes is introduced as an independent contractor hired to clean up the city after the events of the first Avengers film, only for Stark Industries to pull the rug out from under him by supplying its own cleanup crew. Toomes has a very legitimate gripe against Tony Stark, and thus on some level we can identify with his character from the first scene. But Toomes gets a hold of some of the alien technology from The Avengers and becomes a uniquely equipped arms dealer. Keaton plays the role as an industrious working-class stiff seething with resentment, who will do literally anything to protect his interests. There's a third-act scene between Toomes and Peter where Keaton's performance becomes positively frightening; from an acting standpoint this is probably the best scene in the film. 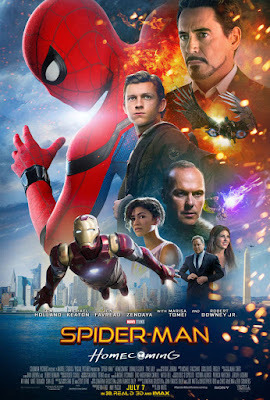 Where I found Sam Raimi's trilogy hit-or-miss (part 3 was almost entirely a miss) and Marc Webb's two films just became silly, director Jon Watts has created a well-balanced Spider-Man film that stands mostly on its own but also fits into the larger Avengers scope. The action sequences are exciting and well-crafted but pretty grounded and not overly long, while the day-to-day of Peter's life feels much more real than anything we've seen in previous Spider-Man films. And most of all we finally have a cinematic Spider-Man who finds the right mix of wide-eyed naivete and affable cleverness. I must say I'm looking forward to seeing Spidey and Hulk sharing the screen in Infinity War next year (This is just as big a deal for me as seeing Batman and Superman together). Somewhere the ten-year-old Justin is very jealous right now. I give Spider-Man: Homecoming ***1/2 out of ****.